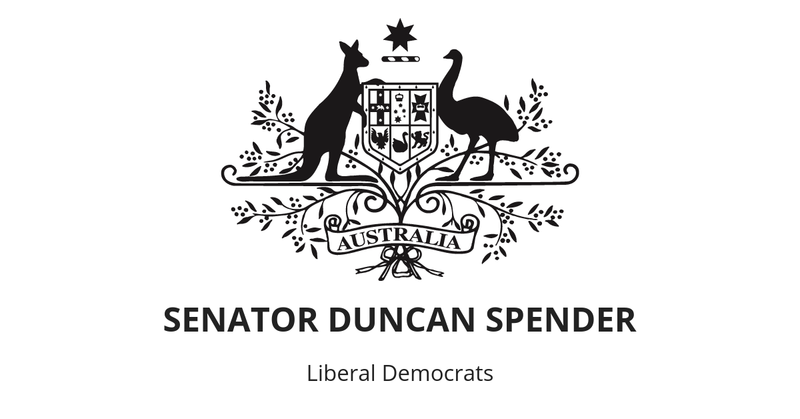 Senator Duncan Spender of the Liberal Democrats has slammed Labor and the Coalition for suspending the remaining Senate Estimates with the calling of the federal election. “The Coalition and Labor opposed my motion for the scheduled quizzing of public servants to continue irrespective of the calling of an election. In doing so the Coalition and Labor voted to give their Senators today and tomorrow off. The Senate is a continuing chamber so can continue to work during an election period. “It’s a bit rich for Labor to be complaining now when they had the chance to support my motion and ensure Estimates would continue,” Senator Spender said. “Because of a lazy Coalition and Labor, I am blocked from quizzing public servants on the latest Murray Darling cash splash, which won’t save struggling communities across regional New South Wales. “Because of a lazy Coalition and Labor, I am blocked from quizzing public servants about the failed Community Development Program. This work-for-the-dole program keeps indigenous Australians in dysfunctional communities and is under investigation for having participants operate saws without any shoes, eye protection or hearing protection. “Because of a lazy Coalition and Labor, I am blocked from quizzing public servants about the evidence for increasing pre-school, compared to the quality of care provided by stay‑at‑home parents. “And because of a lazy Coalition and Labor, I am blocked from quizzing public servants about slow progress and ballooning costs under the National Disability Insurance Scheme. “In the coming weeks the Liberal Democrats will campaign to let voters know we will block Labor’s massive tax hikes in the Senate.